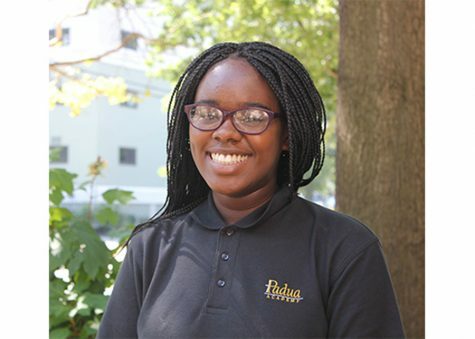 Niki D. is a freshman at Padua Academy and is an aspiring writer and loves to read. She joined multimedia journalism because she wanted to be able to write for Padua360 and learn how to be a photographer in the process. She likes to try new things and is passionate about her writing and trying to be true to herself. To her, being a team player is someone who doesn’t take full control over a group and lets everyone shine and believes quality is effort and taking your time to get to your fullest potential. For something to be quality, you need to do things with the intention of doing it well because she doesn’t think there is a point of putting half effort into something. To her, independence is being able to lead and do things on your own but still ask for help when needed. Her favorite books are The Outsiders by S. E. Hinton, 13 Reasons Why by Jay Asher, and The Divergent series by Veronica Roth. However, she struggles with math. In ten years she can see herself out of college and getting a masters degree or publishing books and grown in her faith. Her role models include, Nelson Mandela, Maya Angelou, and Jane Goodall. In school, she plans on joining Poetry Out Loud and wants to be part of Student Council. Her favorite music genres are pop, electronic, and some R&B although she doesn’t dislike any music and will listen to anything. When asked who would be one person she’d be willing to be for a day, she said either Diane Lane, Maya Angelou, or Audrey Hepburn. She would one day like to visit Ireland, Scotland, and England. When not in school she reads, watches Netflix, and sleeps. She says her biggest challenges are her own insecurities but plans on trying to overcome them. She works diligently under pressure, but her nerves sometimes get the best of her, even if she knows how to control them. She enjoys talking to others about her interests, books, english, and history.